For almost a century, most bicycles had fairly large wheels. By the 1960s, a different approach was being considered. Alex Moulton launched a small-wheeled bicycle, with high pressure tyres and rubber suspension. Its speed, manoeuvrability and comfortable ride astonished people. The design has evolved through many iterations but remains popular with cyclists everywhere, and the Moulton Bicycle is considered by many the best touring bike in the world. In the 1950s, Alexander Eric Moulton (1920-2012) was developing rubber suspension systems for cars. However, fuel shortages caused by the Suez Crisis of 1956 prompted him to return to riding a bicycle. From an engineering perspective, Moulton was fascinated by the efficiency it offered as a means of transport and decided to equip himself with the best available. He acquired a handmade lightweight Hetchins bicycle, featuring high pressure tyres and 'curly' stays to the rear wheel to moderate vibration. Though responsive and lively, he felt its diamond-shaped frame — "that quadrilateral bit of piping" as he called it— could be improved. The frame's top cross bar hampered getting on and off, and there was no space for carrying anything. In 1957, Moulton set about improving the ergonomics and performance of the traditional bicycle, rethinking the basic design and ultimately producing a machine unlike any other. He compared different types of existing bikes to establish their best and worst characteristics. Among them was a 1930s Grubb long wheelbase recumbent bicycle. Its low profile reduced wind resistance but caused leg strain when ridden for long periods. It was awkward going uphill and got splashed frequently by passing vehicles. Completely upright riding also had disadvantages and he decided the now-conventional racing position "operating onto a pedal and crank mechanism" was better aerodynamically, and easier for steering control. Moulton noticed that the smaller wheels of modern motor cars gave them greater manoeuvrability. The Mini, designed in 1957 by Alexander Arnold 'Alec' Issigonis (1906-88, knighted 1969) and for which Moulton devised the rubber suspension system, had small wheels. This gave the car nippy handling and maximised space inside the small chassis. Small wheels also meant faster acceleration owing to lower inertia, as well as the stability of a low centre of gravity. However, on a bicycle if the ground is uneven, small wheels also transmit more vibration. Moulton’s Mark 1 prototype, completed in early 1959, had 356mm diameter wheels fitted with high pressure tyres, calliper brakes and trailing-link front fork suspension with a rubber spring in tension. It was built for rigidity, with a monocoque frame of lightweight duralumin (aluminium alloy) plates. A horizontal panel ran from above the front wheel to beyond the rear wheel, with cut-outs for the pedals, and vertical triangular panels supported the handlebars and saddle. It looked like a rather chunky reclining letter F and so was dubbed the F-frame. The front wheel had a separate cowl. The monocoque shell weighed only 2.5kg, though it relied on a sub-frame to carry the transmission system and absorb the active loading. The machine was not particularly attractive and produced a lot of road noise. Moulton and his colleagues experimented with at least 30 other frame designs, including examples constructed in laminated timber and mild steel. The revised F-frame, sometimes known as the ‘lazy F’, was constructed in tubular metal. Its steering and saddle posts leaned backwards and were connected by a perpendicular main strut from the steering post to the rear wheel. A near-horizontal bar from the main strut ran through the saddle post, forming a carrying handle. It extended over the rear wheel to provide luggage support as well as frame rigidity. Since the saddle was at the conventional height, the extra space between the top of the Moulton’s wheels and the saddle could be used for large front and rear paniers. The design dispensed with an upper cross bar, making it a step-through open frame bike. The front suspension was modified to use the rubber spring in compression. Rear wheel rubber suspension was installed inside the lower end of the main strut, acting in compression and shear with a friction damper. The improved suspension system resulted in a smooth ride but tended to make the wheel turn outwards in a bend. So the front suspension was changed to a telescopic spring inside the steering column, consisting of a rubber core surrounded by a coil spring with the rubber carrying 80 percent of the load. The wheel size was increased to 406mm diameter and fitted with tyres 35mm wide, pressurised to 413.7kN per sq m (60psi). Moulton and Italian car designer Sergio Pininfarina (1926-2012) also trialled many forms of aerodynamic cowlings, for weather protection and cycling effort reduction. They also investigated using solid tyres, and enclosing the spokes in glass fibre discs to reduce turbulence. Eventually all these refinements were discarded as too cumbersome for most riders. On 16th November 1959, the ‘lazy F’ frame design was filed for patent (No. GB907467, granted 27th October 1960). On 19th November 1959, Moulton invited George H.B. Wilson (d.1963), the chairman of Raleigh, to see and test the new bicycle. Wilson borrowed the prototype and the patent drawings, with the intention of collaborating with Moulton and mass-producing it. In October 1960, Moulton and Raleigh entered into a licensing agreement and, to allay the hostility of Raleigh staff, Moulton offered the first 10,000 bicycles royalty free. Production was scheduled to begin in November 1961 but work stalled in September 1961. Raleigh abandoned the agreement in January 1962. Despite Raleigh’s scepticism about the potential profitability of such a radically different design, Moulton’s own market research — carried out anonymously in Irvine, Scotland — indicated otherwise. He sought planning permission for a factory on his own land at The Hall in Bradford-on-Avon, Wiltshire. In April 1962, he set up Moulton Bicycles Limited. Borrowing from automotive practice, the frames were to be pressed and welded rather than lugged and brazed, as was more usual at the time. On 12th November 1962, the Moulton bicycle was launched at the Cycle & Motor Cycle Show, Earls Court, London. It was an instant success, and the factory couldn't cope with the number of orders. Fortunately, the British Motor Corporation Limited (BMC) — which made the Mini — offered to manufacture the biikes from its plant at Kirkby in Liverpool. On 9th December 1962, racing cyclist John Woodburn (1936-2017) broke the Cardiff to London speed record on a Moulton bike, covering 260.7km at an average of 38.6kph (24mph). By around November 1963, Moulton had become the second-largest constructor of bicycle frames in Britain. By 1966, Moulton cycles were exported to 30 countries and built under license in the USA, Australia, South Africa and Norway. Most of the export bicycles were made in Bradford-on-Avon. On 17th July 1965, Raleigh launched its RSW16 bicycle in direct competition. It too had 406mm diameter wheels but was cheaper. To avoid infringing Moulton’s various patents, the Raleigh bike used 51mm wide low pressure tyres at around 241.3kN per sq m (35psi), and had a shorter wheelbase and no suspension, making it slower and harder to pedal. In response, Moulton unveiled the Moulton Mini, with 356mm wheels and designed for smaller riders. However, the inferior performance of Raleigh’s models damaged public perception of the benefits of small wheeled bikes. Fierce competition led to falling sales figures for both companies. To compound the issue, increased production of Moulton cycles reduced build quality — inexperienced welders overheated the frames, particularly at Kirkby. On 29th July 1967, Moulton Bicycles Ltd was sold to Raleigh. Alex Moulton was retained as a consultant, enabling Raleigh to use the 30 patents then covering the bike. But Raleigh did not follow the specifications. Some models omitted the front suspension, resulting in cracking of the frames. In 1974, after a further eight patents had been granted, Raleigh stopped making Moulton bikes and on 31st January 1975, terminated its consultancy agreement with Moulton. Moulton, freed from collaboration with Raleigh, embarked on a detailed scientific analysis of the bike. He intended designing a new one, engineered for excellence and aimed at the top of the market. He began by testing different frames, initially concentrating on two dimensional X-frame and Y-frame configurations. A three-dimensional structurally rigid ‘space frame’ was to follow. In June 1977, Moulton built two test frames, each a lightweight non-separable truss of thin Reynolds 531 steel tubes, which he tested for torsional and lateral stiffness. During August the same year, he produced a separable frame weighing just 1.8kg and built it into a complete bicycle. On 11th November 1979, after further refinements, Moulton himself rode the first prototype of the new AM space frame in Derbyshire’s Peak District. On 1st December 1982, Moulton applied for patents for his space frames (Nos GB2130981 and GB2130982, granted 9th July 1986). In 1983, he founded the independent company Alex Moulton Bicycles and bought back his patent rights from Raleigh. The new bike was tested in secret and the project kept confidential until shortly before the commercial launch of the AM2 Town (two gears) and AM7 Speed (seven gears) models on 19th May 1983. The AM’s stiff frame resulted in good road holding and stable cornering. Its lightness and its suspension system made for a comfortable but lively ride. The wheels are fitted with 432mm diameter 32mm wide high pressure wired-on tyres, manufactured by Wolber, as Dunlop had ceased manufacturing bicycle tyres (later sourced from Bridgestone and Continental). The separable models, in two parts, fit into a small car boot or travel case. On 29th August 1986, Jim Glover recorded the highest speed for a fully faired bicycle (normal bike fitted with an aerodynamic shell) ridden in an upright position. Riding a Moulton AM7 Speed, he reached 82.52kph (51.29 mph) on a 200m course during the 3rd International Human Powered Vehicle Scientific Symposium at Vancouver in Canada. The fairing was made by Doug Milliken. The bike’s 432mm Wolber tyres were pressurised to 827.4kN per sq m (120psi). Glover’s record still stands (2018). In 1987, the 25th anniversary of the Moulton bicycle, the Jubilee model was fitted with an innovative ‘wishbone’ adjustable handlebar stem (patent No. GB8626332). In 1992, the cost effective APB (all purpose bicycle) was launched, and manufactured under licence by Pashley in Stratford upon Avon. It is a development of the AM-ATB (all terrain bicycle) and shares design features such as 508mm wheels and hairpin bent tubes to minimise the number of brazed joints. Its frame is of high tensile steel tub. Later models use Reynolds 531 saddle posts and forks. The APB was replaced by the TSR in 2005. In 1998, the New Series was released, built by hand in Bradford-on-Avon and sharing the AM space frame architecture, with additional weight-saving measures. It uses the Moulton Flexitor suspension system for the front wheel and hydrolastic suspension for the rear, resulting in a faster smoother ride. The tyres are narrow section 406mm diameter, and the bike separates into five parts. In June 2008, Alex Moulton Bicycles merged with Pashley to form the Moulton Bicycle Company. The 1980s AM models are still available (2018) and are made to order in Bradford-on-Avon, with improved suspension like the New Series models and 18 or 20 speed gears. 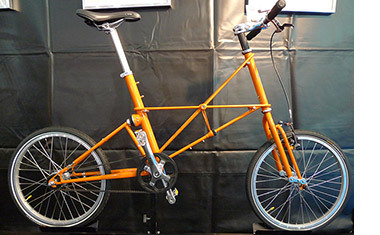 From 2000, Moulton bikes similar to the F-Frame have been manufactured in Japan by Bridgestone. The patented suspension that characterises all Moulton bicycles reduces frame fatigue. Many Moulton bikes have chalked up more than 80,000km — a testament to their high quality manufacture. On 9th April 2010, on his 90th birthday, Alex Moulton unveiled a radical redesign: a prototype known as the MDev 90. Its handlebar and saddle posts are of aluminium, connected to the central kingpin between them by tensioned metal wires running inside carbon fibre tubes. The wires are in tension and the tubes in compression, giving the frame overall stiffness. Few brazed or welded joints are required — the frame can be put together in about 20 minutes. The suspension is similar to that on the New Series and Pylon models, but with narrower Flexitor units on the front. The MDev 90 has yet to go into production (2018). Alex Moulton died in 2012. The company continues in Bradford-on-Avon, as does the Moulton Bicycle Club, founded in 1975. In 2015, a titanium framed Moulton AM Speed was sold at auction for £26,000.